I love the stars on her skirt! Great work! Wow such beautiful coloring and shading. This is some pretty illustration. I bought your first Sakura Clow Card picture, but now I really want this one too ; - ; Ahhhh! This is amazing! Love how you merge the lines of a Clow Card in the background to make it look like an astrological map. This would be amazing as a holo print!! Sooooo sparkly!!! *w* I likes!!! wait, more manga coming out or just a reprint? Aww.. God, this art is amazing! I love all in this picture! Really great job! 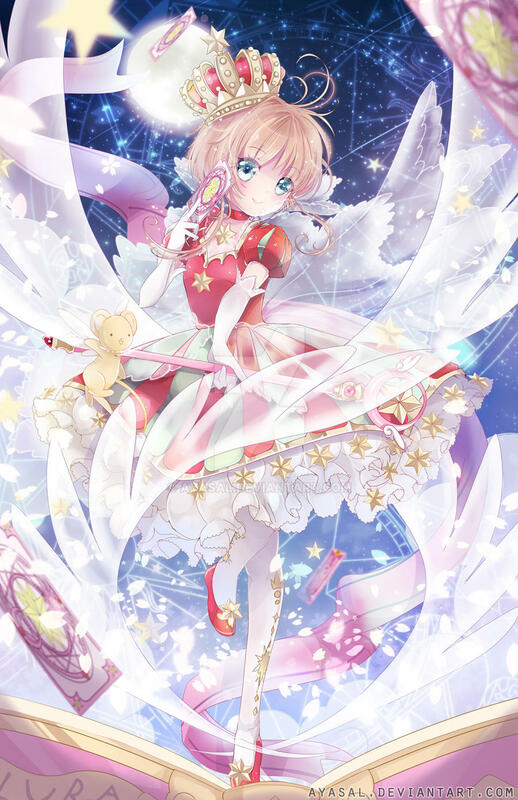 This is gorgeous; I absolutely adore Sakura's new dress; it's such a beautiful design! My fav manga forever & ever!! Awesome dress I love her.